Versatile and easy prep! 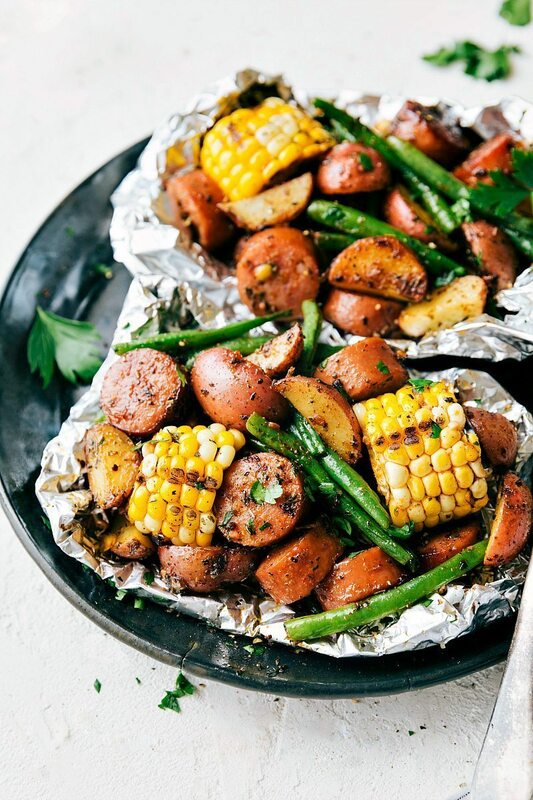 In less than 15 minutes get this tasty dinner on the grill (optional!) Check out Chelsea’s website to see all the different ways you can make this delicious meal. Prep the ingredients: wash and dry the veggies. Coin the sausage. Slice the baby red potatoes in half and then half again. Trim the green beans. Shuck the corn on the cobs and slice into thick coins. Add the prepped sausage, corn, green beans, potatoes and garlic to a large bowl. Toss with all of the seasonings (paprika, dried parsley, Italian seasoning, garlic powder, onion powder, and a generous sprinkle of salt + pepper if desired). Toss until well combined. Divide the mixture evenly among the prepared sheets of foil (4 sheets of foil for larger portions and 6 for slightly smaller portions) and place 1 tablespoon of butter in each packet or prepared baking pan (separate pats of butter evenly on top). Seal the foil packs tightly so no air escapes, but do not double up foil (only one sheet of foil per pack). Carefully open the foil pack expecting steam to be released. Garnish if desired with fresh chopped parsley, any additional salt/pepper, and freshly grated Parmesan cheese on the beans, potatoes, and sausage. Intracoastal Realty’s luxury listings are featured on LuxuryPortfolio.com, the award-winning website that attracts over 3 million high-net-worth visitors. We often spotlight outstanding listings from around the world on this blog. This month’s property selections showcase stunning architecture and exceptional interior and exterior design in exotic locations! We hope you enjoy learning more about these three extraordinary properties. One of Grand Cayman’s finest residences, Villa Mare is set on an estate size lot within Cayman’s premier gated community, Vista del Mar, offering a 24-hour manned security and extensive amenities, including on-site property management and tennis courts. A spectacular and significant 12,000 square foot±, six bed, eight bath residence, developed on 1.64 acres, built in the French-Mediterranean Style, the residence is meticulously maintained and comes with a nearby double dock allowing birthing of substantial craft up to 60 feet+ in length as well as a unique North Sound front dock for mooring smaller vessels. The imposing front gates, flanked by secure walls, open onto a winding driveway, offer a spectacular sense of arrival whilst the lushly-landscaped grounds provide substantial terraces, patios and a selection of charming poolside and waterfront entertaining areas as well as a “beach escape”, all affording stunning views of Cayman’s beautiful North Sound. The home’s living areas include five en-suite bedrooms, with a spacious “master wing” to the ground floor as well as numerous formal and casual living and entertaining areas, and a recently renovated kitchen featuring rare, up-lit, onyx counters. Efficient and well-planned utility rooms and storage areas link the main residence to the four-car garage, above which is located a staff quarters with separate entrance. Plans exist for a separate staff/gatekeeper’s cottage and the site can easily accommodate this or further garages as needed. Undoubtedly one of the Cayman Island’s finest homes, offering waterfront living to the highest standards and levels of sophistication. Situated in one of the most desirable and private corners of Porto Cervo, Villa Carla Felice stands out for its modern lines and uncommon elegance, also for the high standards of the Costa Smeralda. Offering a luxury and privacy in an enviable natural setting, this exquisite six-bedroom villa benefits from direct beach access, via a small path that winds its way through idyllic gardens to the glistening shoreline beyond. Built to the very highest standards and designed to maximize its location, the home is arranged so that every room enjoys a sea view, while sliding doors open on to balconies and terraces, allowing the light to flow in. The main villa comprises four beautiful en suite bedrooms and generously proportioned living areas, and the property also has a spacious two-bedroom guesthouse with independent access, which fully meets the needs to accommodate up to 4 other people. Nestled in a wide, lush Mediterranean garden, the property include a covered outdoor dining area, a magnificent pool, a heated Jacuzzi, and a secure parking. An authentic jewel in the heart of the Costa Smeralda, this immaculate home offers resort-style living at its finest. Nestled in Anchorage, one of the most prestigious gated communities in Coconut Grove, this sublime property lies behind impressive gates. Designed in classic, elegant Italian Palazzo style, this remarkable home built in 1995 feels as though it has been in situ for generations. Introduced by a superb entrance hall/courtyard, the dwelling’s distinctive interior is characterized by beautiful wood and marble floors, striking encased ceilings, boiserie, and exquisite fixtures and fittings. You will enjoy a fine living room with a grand chimney; a large office/library, which has magnificent custom-built bookcases; a comfortable and pleasing breakfast room; and the impressive dining room and charming terrace radiate true sophistication. The master bedroom comprises an en-suite dressing room, walk-in closet, and sauna. All other bedrooms have their own private bath. Other highlights include a four-car garage, an elevator, and a saltwater-heated pool. This estate is one of Coconut Grove’s most unique homes. As an affiliate of Leading Real Estate Companies of the World®, Intracoastal Realty is a local and global market leader working on our clients’ behalf. LeadingRE’s world-class marketing resources and international connections allow our firm to deliver a truly exceptional real estate experience. Our global network produced $55 Billion more U.S. home sales volume last year ($372 Billion total) than the closest competitor. Intracoastal Realty is proud to be an independent real estate firm. Our independent status means that we do not pay exorbitant franchise fees to large corporations outside of our local area. In turn, the company is able to invest more in marketing and in philanthropies that serve the communities in which we live, work, and recreate.